This page will explain the calculations behind the My Practice Report Card feature in TRAKnet 3.0. What is My Practice Report Card? How are the reports calculated? The current total monies collected on charges after contractual write-offs for the past six months. New patients as a percentage of total patient visits for the past six months. The average total dollar value of charges per provider made during the month. The average total dollars collected per provider during the month. The average number of total claims per provider filed during the month. The My Practice Report Card will calculate data for various date ranges always ending at the previous month. During the last seven days of the month, the My Practice Report Card option in TRAKnet will be highlighted in red. For a more in-depth dive into similar statistics for your practice, please reach out to Collaborative Practice Solutions for more information. Numerator = Very similar to the 90 day balance found in the Accounts Receivable report, with some slight variation (which will be lower than the current number). This variation comes from items that have shifted to 90 day balances since the end of last month. Days Past Due = the date of the month (e.g., if today is 1/29/2016 you will enter 29). End Date = The previous month's last day. Providers = Select All providers. The Numerator in the ratio is equal to the Collected amount. The Denominator is equal to the Amount to Collect amount. Percentage = (Collected / Amount to Collect) * 100. Numerator = The quantity from the Treatments by Provider report, run as above, where patients are unique and has diagnoses. Denominator = The total number of unique encounters from the date range. There is no report in TRAKnet that shows an equivalent. The Batch Print Encounters screen, copied to a spreadsheet with duplicate patients removed, will give the most accurate total. Numerator = The Charges total. Denominator = The count of providers in TRAknet who had any charges that month (where charges does not equal 0). Numerator = The Payments total. Denominator = On the bottom of the Activity - Summary report, any provider who has an amount in the Payments column will count. This particular item has no ratio or percentage calculation and is just a flat counter of all claims sent by all providers in that date range. The TriZetto tab at the top of the screen will show a glimpse of your TriZetto web portal, allowing you to see your rejection rate compared to the national average rejection rate. The My Practice Report Card screen is only available to those TRAKnet users who have the Reports permission checked off on their permissions list. At the end of the month, the My Practice Report Card tab will be highlighted in red as a visual queue that the report should be checked before the month rolls over. At the bottom of the My Practice Report Card you can find a sample VPO report. 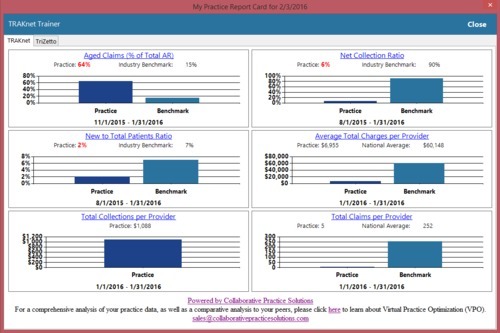 VPO, or Virtual Practice Optimization, is an in-depth dive into your practice, analyzing a large variety of billing statistics and information to pinpoint where you stand. For more information please reach out to sales@collaborativepracticesolutions.com.